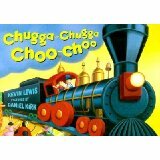 Chugga Chugga Choo Choo takes the toy train through its day and tucks up the kid and the toys together at the end. A very calming read for a train-track mind. Ahh yes trains, my little guy was all about trains, we would take him to the railroad crossing to wait for a train as often as we could because the delight on his face was priceless.